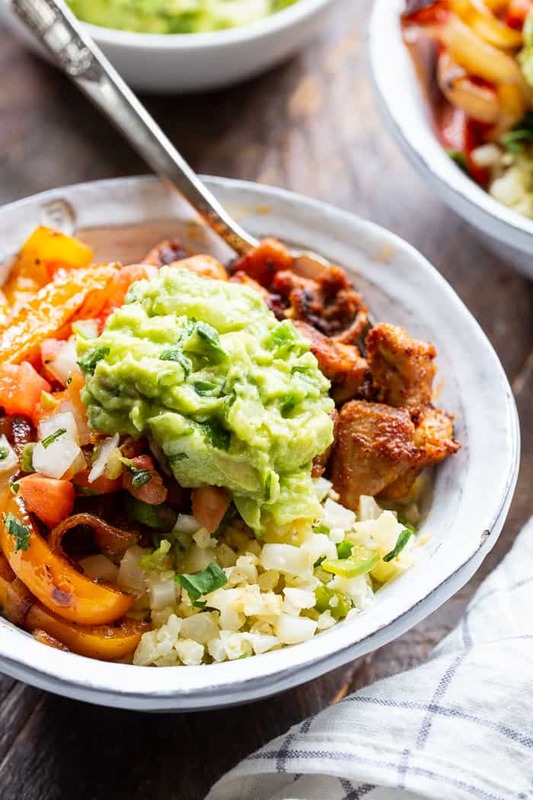 These Paleo Chicken Burrito Bowl are packed with tons of flavor and goodies! 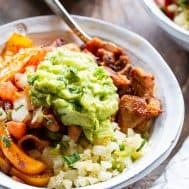 Bite size seasoned chicken thighs, zesty cauliflower rice, pepper and onions plus and easy guac make these bowls healthy, filling, and a family favorite. Whole30 and keto friendly. 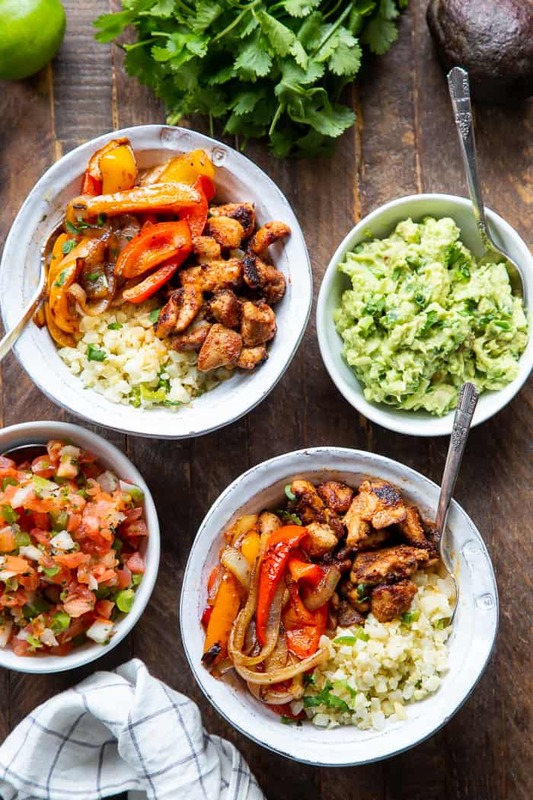 I’m currently on a Mexican food kick and have been making guacamole constantly – I can’t get enough of it! That’s obviously not a problem, except for the fact that avocados are pricey and tricky to buy perfectly ripe. And of course WAITING for guacamole is sometimes just not an option, you know?! Anyway, my loaded paleo burrito bowls are on repeat and I knew I had to make a chicken version that’s just as epic, maybe even better. So here we are! 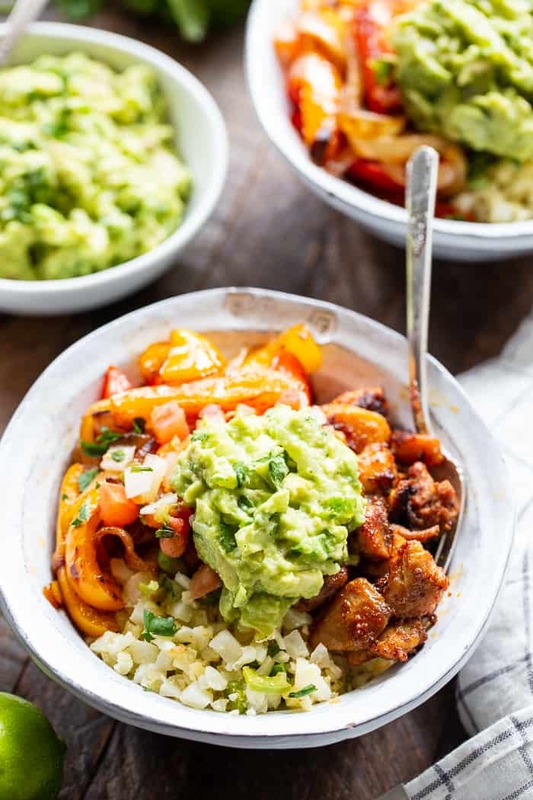 With a chicken burrito bowl that’s insanely flavorful, filling, Whole30 AND keto friendly. We have WON. I decided that for really juicy chicken I needed to use thighs – not breasts. 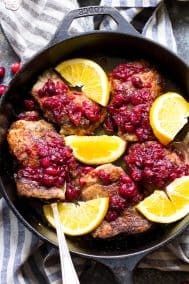 I’m just a chicken thigh fan in general and they definitely work well with the flavors here. If you’re just not that into boneless skinless thighs, you CAN use breasts but be warned – the chicken will be drier! 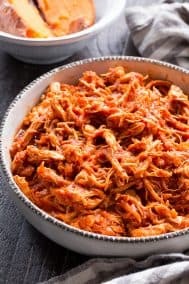 But moving on – the chicken is cut into bite size pieces, seasoned with all the right spices, sautéed until it’s both crisp and juicy at the same time and doused in lime. And we’ve really only just begun! There’s so much more flavor in these bowls – let’s see what we have! A quick fried Mexican cauliflower rice makes the perfect base for the bowl. Then we have the chicken, sautéed peppers and onions, and a quick guacamole to top everything off. It’s just perfect – I’m not exaggerating! 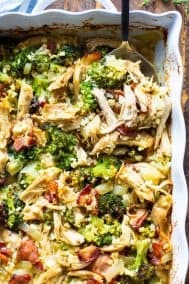 If you’re not on the Whole30 and can’t live without a little cheese, you can totally add a little shredded cheddar in there too between the rice, chicken, and peppers. My husband Adam, who is currently keto-ing, added some and swore it was the best thing he ever ate. It’s definitely at least as good as it looks! 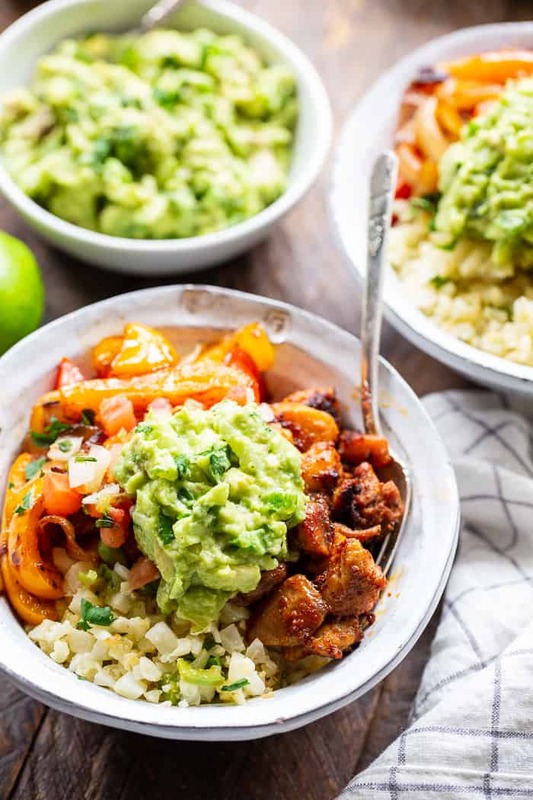 These bowls are perfect for meal prep since they have a few different components that save well in the fridge and are easy to throw together last minute. Of course I’d wait until serving before making the guac. It’s a good thing avocados are so darn yummy otherwise I’d have so many reasons to be mad at them. 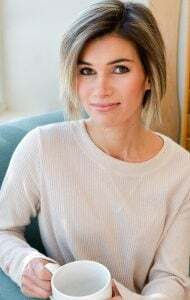 I hope you’re ready for a fun, easy dinner that’s good for you in all the ways it can be! 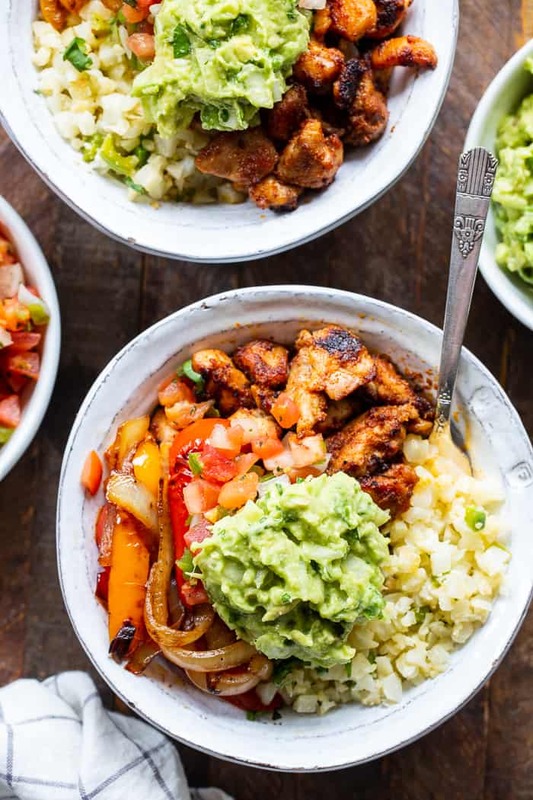 Grab some RIPE avocados, some cauli rice and lots of lime, and let’s make these paleo chicken burrito bowls! Salsa fresh herbs, sliced jalapeño. Heat a large skillet over medium heat and add oil or ghee. Add the riced cauliflower and stir to coat. Cover skillet and cook for about 2-3 minutes to steam. Uncover and stir, then add the jalapeño, salt, seasonings and lime juice. Cook and stir another minute or two uncovered until you have desired texture, then remove from heat and set aside. 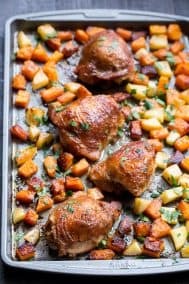 Cut chicken thighs into bites size pieces. Season all over with all seasonings (not the lime) and heat a large skillet over medium high heat (you can move the rice to a bowl and use the same one) and add 1 Tbsp cooking fat. Add chicken and brown all over, stirring as needed. Stir and cook over medium/medium high heat for 7 mins or until cooked through. Lower heat a bit and add the lime juice, stir and continue to cook another 2-3 minutes, then remove from heat and place in a bowl. 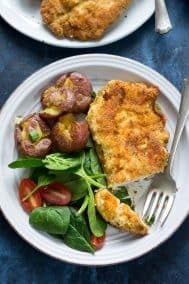 Keep the heat on medium and add another Tbsp fat to the skillet. Add peppers and onions and stir to coat with fat. Sprinkle with a bit of sea salt to taste, and continue to cook, stirring occasionally, about 5 minutes or until softened and browning, then remove from heat. To make the guacomole, mash together the avocado with the rest of the ingredients, adjusting seasonings to taste. 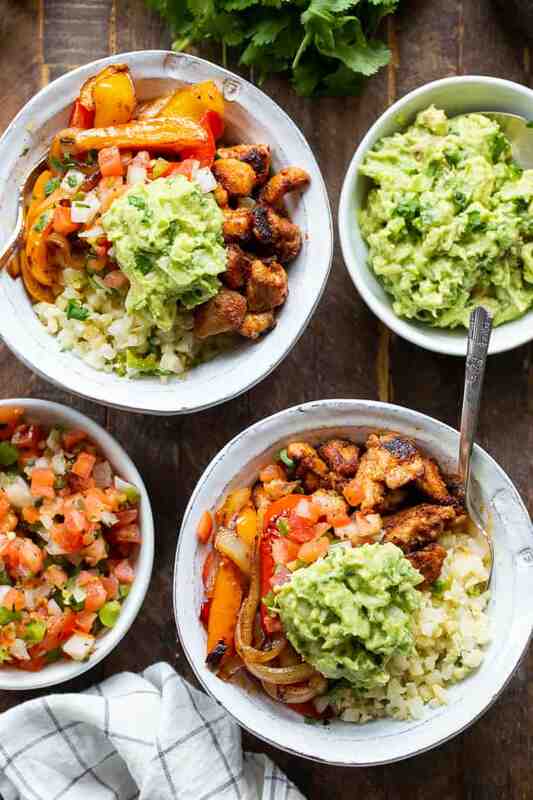 Layer the cauli rice, chicken, peppers and onions in bowls, then top with guac and any other desired toppings. Serve right away and enjoy! 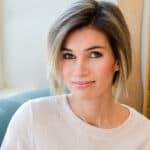 Want More Whole30 and Keto Dinner Recipes? Try One of These! Loving this homemade chicken burrito bowl! That chicken sounds incredible and I’d definitely top mine with all the avocado! Love this! 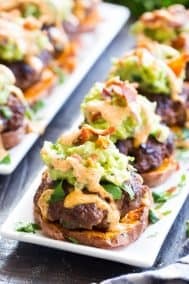 Great Paleo option for the family. My husband loved it. Honestly can’t tell the difference between this and real rice. Made this for dinner tonight and OMG! it is so good. The spices on the chicken are tasty and the onions and peppers are the perfect topping. Will definitely be making this again. 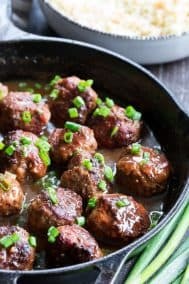 Pretty new to paleo and incorporating more veggies. This was delicious!! This was sooooo good! Flavors were amazing. I used a creamy avocado dressing I had made earlier (basically guacamole) instead of traditional guac and it was still awesome! Couldn’t print the recipe, but then installed all the Windows updates and it worked fine. I have to try it – it looks so delicious. 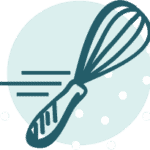 Some of my culinary courses and webinars are saved in the Video tutorials section of the custom writing blog. 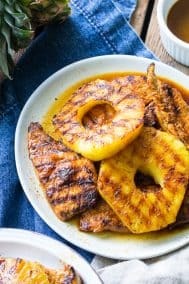 I’m on my last week of Whole30, and this is the best recipe I have tried! I wish I would have found it sooner lol. Delicious, and definitely fulfilled my Mexican craving.